"EPA Proves Flameproof Mattresses Toxic"
After verifying the facts, a medical journal published this article. The article is reprinted from "The American Chiropractor" magazine, a non-profit medical journal. It appeared in the November 2006 issue pages 54-55. It is mailed to about 40,000 Chiropractors across the United States. To see a scanned version of how the article appeared in the magazine as a PDF file click here. "New federal standards, new health hazards -- How you can protect your patients." Again after verifying the facts another leading medical journal, Chiropractic Economics, published this article in their March 30, 2007, magazine. It is mailed to about 35,000 leading Chiropractors across the country. See the PDF file as reprinted from the magazine by clicking here. A short 500 word version that tells the highlights of the story. A 1,000 word article with references. A 3,000 word article that tells more of the story including how the innerspring mattress industry ask for and supported the new California law and national regulation, and how it benefits them. Plus it tells the US Consumer Products Safety Commission side of the story, and how it will cost consumers 1.11 Billion dollars, and limit liability for mattress manufacturers. It tries to tell a balanced story and gives background information of the chemical risks and how we made toxic mistakes in the past. 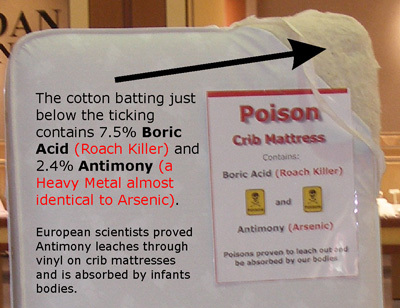 This collection includes selected highlighted pages from the CPSC risk assessment that prove the chemicals really used in mattresses, that we will absorb toxins, that they excluded children under age five, the problems and omissions in the report and how their conclusions are invalid from a report designed to reach a preexisting conclusion. Plus there are Doctor comments and public comments from people who have gotten sick from flameproof mattress, and more. Please see other news we have gotten in the past from the San Francisco to the Washington Post and more, at our link: Making News.